You may not spend a lot of time thinking about your bedroom or your bed, but if you’ve been struggling to get a good night’s sleep, it’s time to take a closer look at your room. After all, we spend nearly a third of our lives in bed! 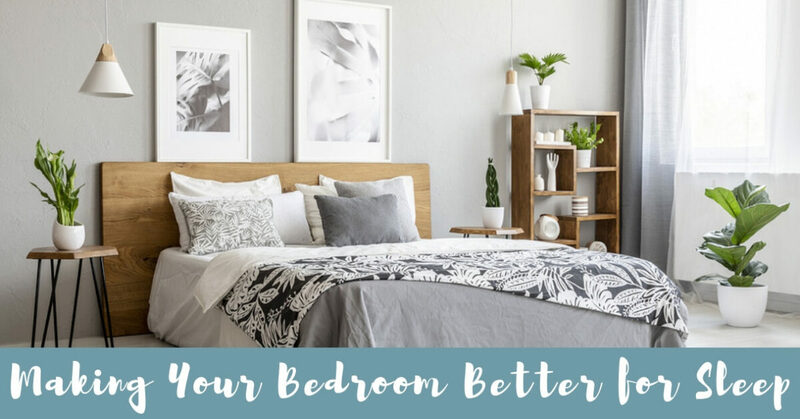 This makes your bedroom one of the most important rooms in your house, and learning how to make your bed just right might be the key to getting the sleep you need. It might be tempting to buy a cheap mattress and call it a day, but investing in a quality bed could make all the difference in the world to your sleep patterns. Is your bed too soft? You’ll find yourself waking up with a sore back or aching limbs. A bed that’s too hard can cause back pain, or have you waking up in the middle of the night in discomfort. Leaving your room in disarray may not seem like a big deal, and you might not like making your bed in the morning, but having a messy room might cost you a good night’s sleep. Creating a cozy space doesn’t have to be time consuming, or cost a lot of money, and you don’t need fancy linen sheets to make your room an inviting space. The first step in creating a cozy space is choosing a neutral color palette. Red or yellow might be your favorite color, but save it for the kitchen, or an accent wall in your living room. In the bedroom, try to stick with soft, earthy colors, and avoid complex patterns. Keep your quilt neutral too, and if you feel like you need a pop of color, add a throw or an accent pillow. Experiment with a few different textures or muted patterns to create interest, but keep the colors neutral. You might like to curl up in bed and watch TV, but if you’ve been struggling to sleep, leave the TV in the living room. Keep your room as a place designated to sleeping, and avoid having electronics in the room. While a fluffy duvet might look inviting, heavy quilts may not be helping you sleep. These bulky layers are often too warm and end up on the floor, disrupting your sleep and waking you up in the middle of the night to kick off the extra layers. Pick a lighter fabric like cotton or linen, and rather than a duvet, choose a lightweight, washable quilt. Interior designer Jennifer Stoner recommends single-ply 250-thread-count sheets. “Americans have become obsessed with thread count, which is usually a red herring,” she explains. In fact, single-ply sheets are softer, more comfortable, and last longer than double-ply sheets. You don’t think twice about changing your wardrobe with the seasons, so get into the habit of changing your bedding as well. Winter weather is a time to make your bed extra cozy and inviting, with fabrics like chenille. During the summer months keep it light and breezy with linen. Don’t underestimate the power of a good pillow. If you’re struggling to sleep through the night, you need to evaluate your pillow, and choose the perfect fit for you. A good pillow will support your neck throughout the night, and keep your spine aligned. Pick your pillow based on your sleep position. If you sleep on your back, you’ll need to select a slightly flatter pillow, since your spine is resting on the bed. Are you a side sleeper? You’ll need a higher, firmer pillow to provide proper neck support. If you sleep with your knees bent, place another pillow between your knees to keep your spine aligned during the night. You’ll wake up refreshed, and won’t struggle with back pain. For those who sleep on their stomach, find a flat pillow, so your head is almost resting on the mattress. If you’ve been struggling to get a good night’s rest, can’t fall asleep in the evening, or wake up repeatedly during the night, visit us at Sound Sleep Medical to discuss your sleep. We’ll evaluate your sleep cycles, and find out what’s keeping you awake. Visit us today to find out how a good night’s sleep can change your life.